Actor Taron Egerton sure knows the way to a gay mans heart. 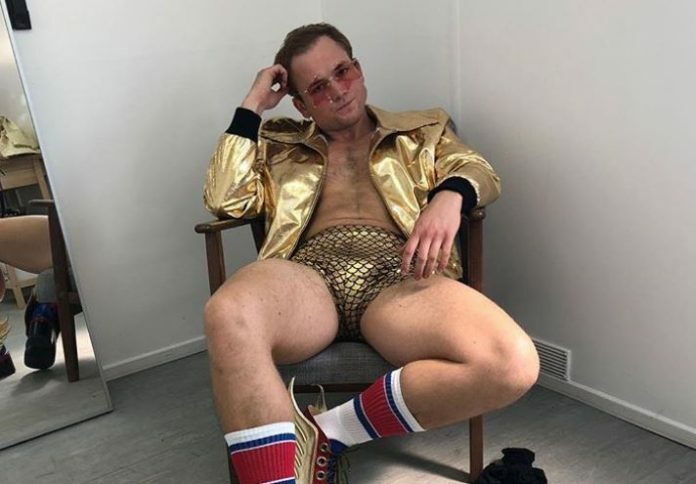 For Elton John’s birthday, the Rockeman actor posted a steamy hot picture of himself from the set of the movie. Taron plays Elton John in the upcoming movie about the legends career and life. The movie arrives in theaters May 31. “37 million people globally are living with HIV. Last year alone, 1.8 million people contracted the virus and 940,000 died of an AIDS-related illness. This need not happen. The letter was co-signed by The Independent’s owner Evgeny Lebedev, and was a contribution in the fight to stop the stigma that is still surrounding HIV and AIDS even today. “The challenge is that too many people still do not realize they are at risk, are too afraid of the stigma or are denied the chance of taking an HIV test,” Elton writes. “The theme of World Aids Day on Saturday – the 30th year of the international awareness campaign – was “know your status”. Why? Because everyone should understand the risks of HIV, and everyone who needs it should have the chance of dignified help and support. That can only happen if we know our status. At birth, Sir Elton Hercules John was named Reginald Kenneth Dwight. He was born in Pinner, Middlesex, England. His primary address is Woodside, Old Windsor in England but John also owns property in Atlanta Georgia, Los Angeles California, and Nice France among others. Elton John is a world famous musician, singer and composer. His career spans five decades starting in 1967 when he met his songwriting partner Bernie Taupin. His debut album “Empty Sky” was released in 1969 and his first hit single was “Your Song” from his self-titled second Album in 1970. He has sold over 300 million records and has over 50 Top 40 hits. He has received 5 Grammy Awards and 5 Brit Awards, an Academy Award and a Tony Award. Elton John composed the music for “The Lion King” movie and Broadway musical. He was ranked the third on Billboard’s Hot 100 Top All Time Artists behind The Beatles and Madonna. Queen Elizabeth II knighted Elton John in 1998 for “services to music and charitable services”. He has been active in the fight against AIDS since the 1980’s and established the Elton John AIDS Foundation in 1992. Elton John came out as bisexual in an interview with Rolling Stone magazine in 1976. In 1984 he married a female recording engineer named Renate Blauel. They divorced in 1988 and in the same year he came out as gay. He has since stated that he never thought he was keeping his sexuality a secret. On December 21, 2005 Elton John and his partner David Furnish were among the first couples in the UK to be joined in a civil partnership. Once gay marriage became legal in the United Kingdom, the couple married on the ninth anniversary of their civil partnership on December 21, 2014.